The same people who brought you the Plated Landscape dinners opened up a brick and mortar spot last spring, and we recently had a chance to check it out. Located on the West side of Cleveland, Spice Kitchen and Bar is bigger than I expected, and a bit more genteel than I was expecting as well. Nice mix, with kind of a Southern vibe to it; drinks were served in Mason jars. The menu is simple and seasonal. And of course, the food. 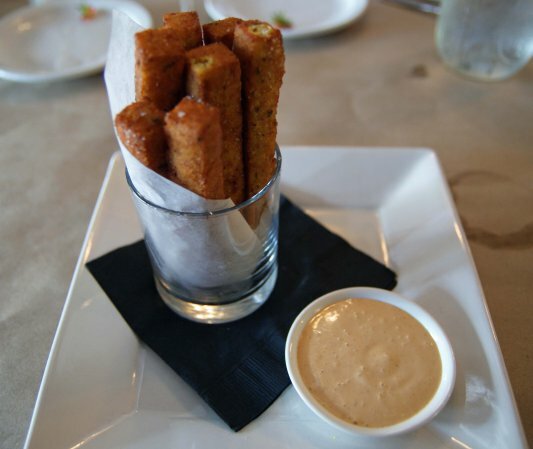 We started with something different, polenta chickpea fries. Not sure how they’re made (extruded into a fryer? cooked, then cut, then fried? ), but they had a nice flavor. Not like fried hummus, but more subtle, and with a nice spicy remoulade to dip. 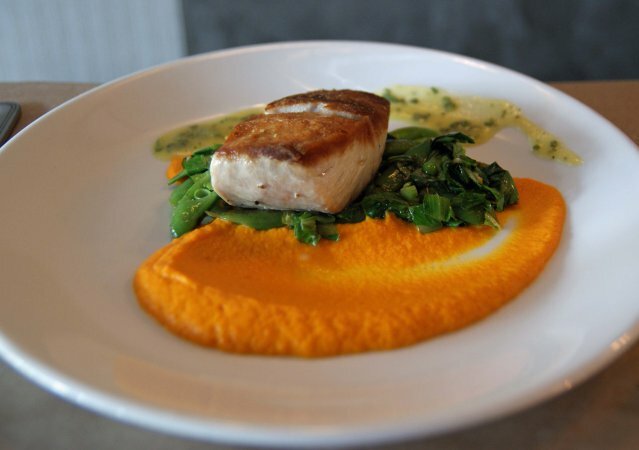 For entrees, S chose a pan-seared mahi mahi, atop a ginger-carrot puree, bok choy and snap peas, and drizzled with a preserved lemon sauce. The fish was excellent, while the ginger and carrot paired beautifully. 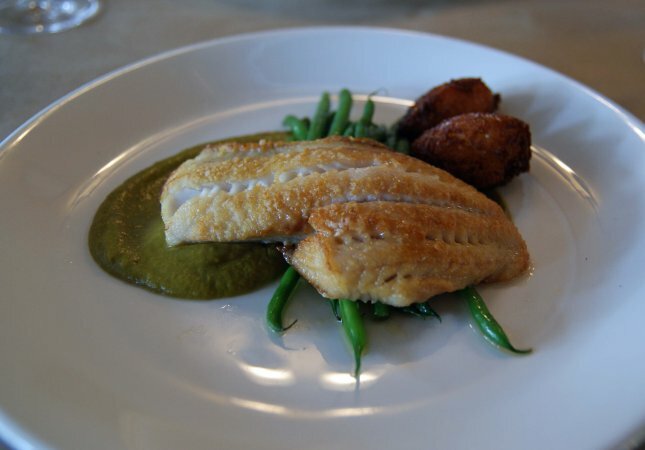 I tried another pan-seared fish, this one walleye, with rice fritters, green beans, and a scallion puree. Again, the fish was perfect – nice crunch on the outside, but a flaky interior. The fritters looked like nothing more than rice, but they had a hint of sweetness. Simple, but good. 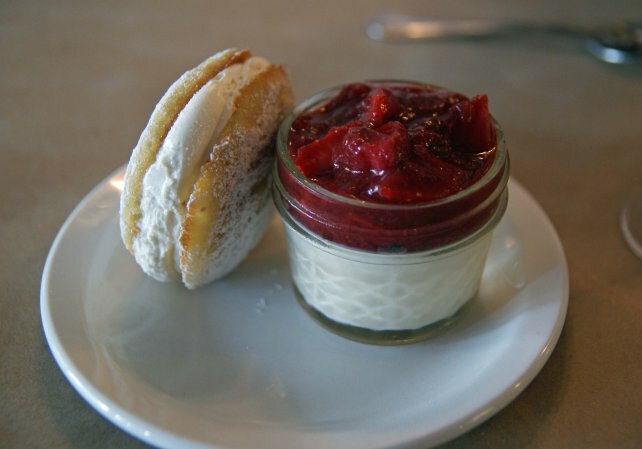 Dessert was a creamy panna cotta, with strawberry-rhubarb compote and a lemon whoopee pie. As usual, no words necessary. The verdict: Spice gets 6 stars out of 7. The food was great (and what we loved is that it all seemed like something we could make at home – fancy food is nice, but simple and elegant is nice too), service was great, and prices were about average ($16-25 entrees). Highly recommended.